As an office building owner, tenant or employee, you may have questions about the seismic safety of your building or work environment. This may have been the topic of a water cooler conversation. 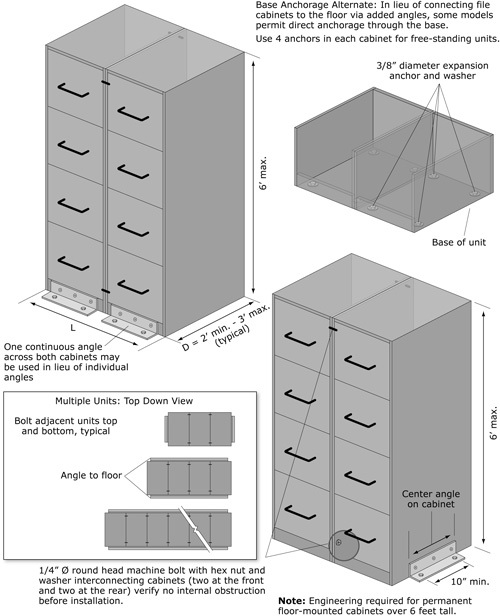 You may have asked, “Will my filling cabinet fall on me during an earthquake?" Predicting a building and its contents response to an earthquake is nearly impossible. In order to insure safety to building occupants, state building codes provide minimum guidelines for equipment and furniture anchorage. ASCE 7 is the code that governs the seismic design of nonstructural components and their anchorage. Specifically, Chapter 13, Seismic Design Requirements for Nonstructural Component. As a minimum, the items listed in table 13.5-1 shall have positive anchorage to protect the life/safety of the building occupants. These items include but are not limited to walls, ceilings, cabinets, equipment and fire sprinkler piping. 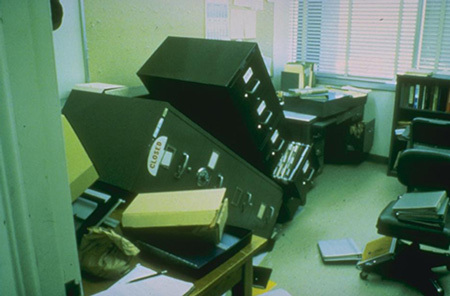 Past earthquakes have shown that unanchored office file cabinets can present a major life/safety hazard during an earthquake. 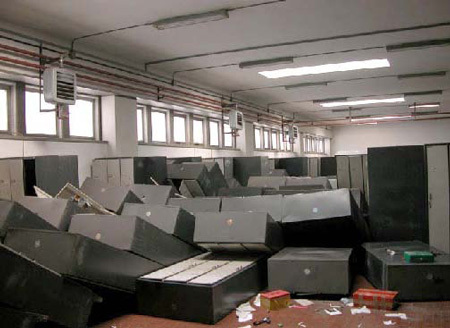 File cabinets can topple over injuring people and trapping occupants inside the building. The codes require that any permanent floor-supported storage cabinet, library shelving, book stacks and book selves over 6ft tall, including contents shall be properly anchored to prevent sliding and toppling during a seismic event. Our recommendation is that any of these items over waist high should be properly secured. 1. Do not locate file cabinets where their failure could block an exit door or exit corridor. 2. 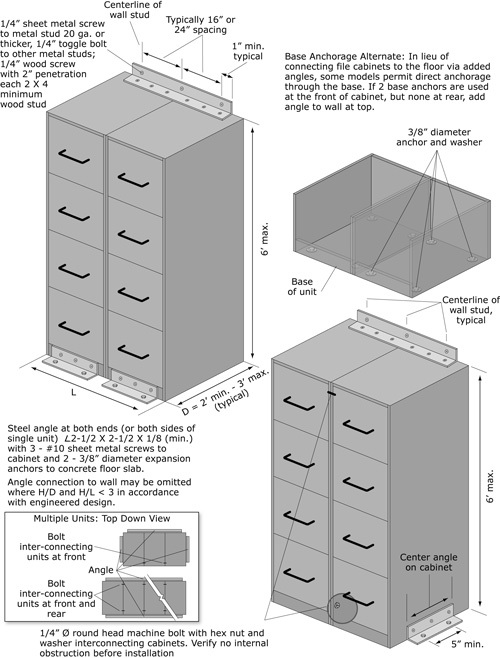 Anchor file cabinets to the floor and/or wall to prevent toppling during a seismic event. 3. Provide strong drawer latches to prevent drawers from sliding open. 4. 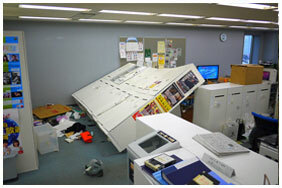 Do not place objects on top of file cabinets as they may be thrown off during a seismic event. 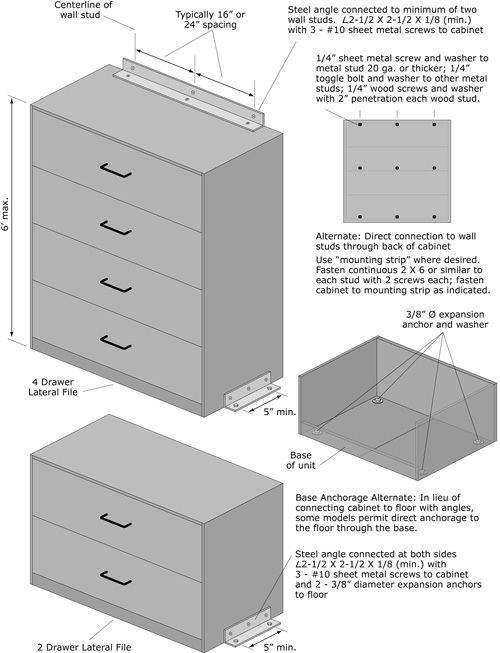 FEMA also provides anchorage details for cabinets up to 6 ft tall. See below. We recommend that you consult with your Structural Engineer to insure proper anchorage, especially for cabinets taller than 6ft.